Your IT department is essential to proper business function and security. With that in mind, it’s critical to take IT infrastructure into account as you navigate your merger or acquisition. 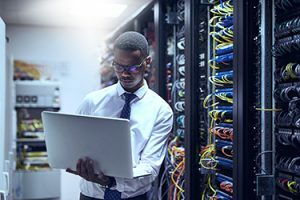 When a merger or acquisition is on the horizon, the effects on your IT department can be a nightmare. Often the IT leaders and CIO aren’t brought in for planning and discussions until the majority of the work for the merger has been completed. While this trend is common, it’s not the most conducive to a smooth transition. Your IT department is essential to proper business function and security. With that in mind, it’s critical to take IT infrastructure into account as you navigate your merger or acquisition. One of the best ways to ensure a seamless transition is to make sure your IT infrastructures are compatible before you begin your merger. While its possible to upgrade an older system to match yours be warned that depending on the state of the two systems coming to a match might be expensive and time-consuming. The cost of getting your systems on the same page should be considered in part of your pricing before you make any purchase agreements. For instance, if you need to replace a mainframe with a core processor, your workload and costs can quickly become exponentially increased. At a certain point, it may be in your best interest to hire IT consultants to help shoulder some of the work involved in your transition. Not only will consultants likely have knowledge specific to the tasks at hand, but they will be able to devote their full attention to the transition without risking neglecting other work. Not to mention, if you bring in IT consultants who focus on mergers and acquisitions early in the process they can help develop a full transition plan. Not only will this prepare you for costs and needs, but it can make the whole process far more straightforward. This entry was posted on Friday, May 18th, 2018 at 2:13 pm. Both comments and pings are currently closed.